I guess that’s a way to end everything. 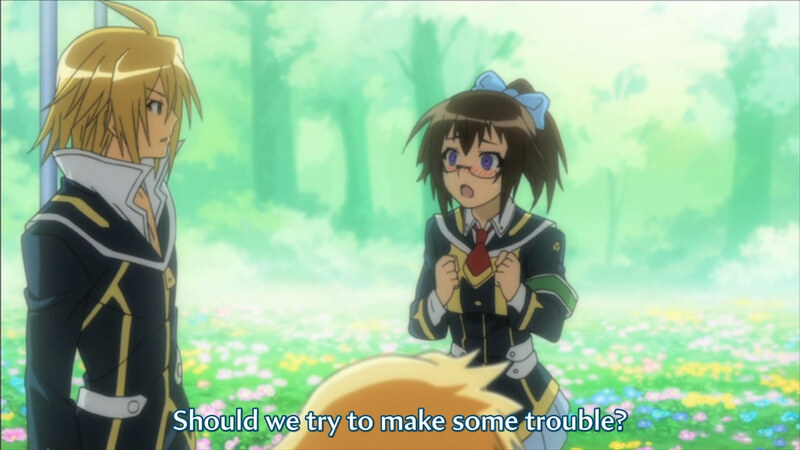 Back to business as usual, with the suggestion being a giant analogy to the student council’s own situation without Medaka. Naturally, everything was fairly chill this week without her to go over-the-top. After the ridiculous battle that destroyed the school, what else could you ask? I will say this, though…I know what it feels like to have no one want to compete with you. It’s not fun to strive to become better while everyone else around you is content. 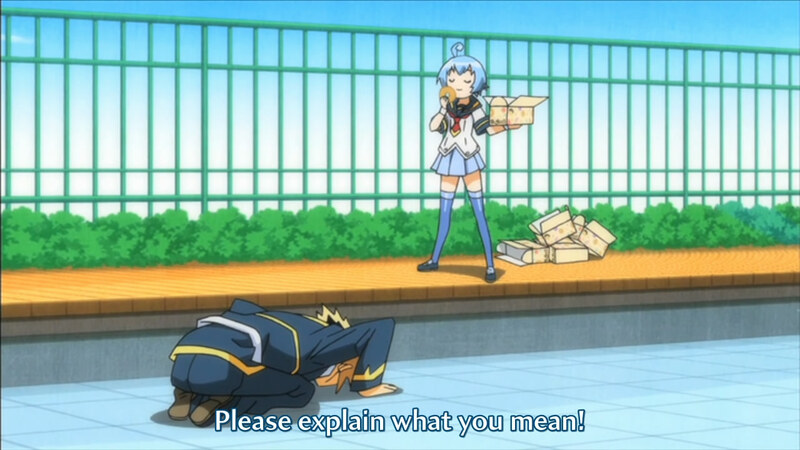 That being said, what Natayama did was excessive, but I can see what she feels to a point. The final scene sets up for the second season by introducing a new enemy. I’m not sure if I could say that it has been an enjoyable experience with this show…mostly because it almost felt like there was filler material in such a short season. Based on what I hear, things get crazy from here with everyone introduced, so maybe the second season will offer something more interesting. I can only hope. I may give it a shot…we’ll see. Hmm…even though I completely predicted this episode, I don’t feel satisfied…too easy? Sigh…oh well. Unzen hasn’t joined yet, but he was offered VP position as predicted. Plus, he’s showing the signs of future recruitment with his worry for Medaka that she will become unstable if allowed to kill someone. The bit at the end with the Academy Director suggests something going on in the background, which I suppose makes sense with all of the people telling me about a genre shift in the manga. Unfortunately, we won’t be seeing that in this season, but it definitely makes it more likely that subsequent seasons are to come. Next week looks like a simple filler of doing student council work while Medaka is out…kind of a lame way to end it in my eyes, but we’ll see. Well…that was different. I guess the idea is to show the imperfection of Medaka by allowing her to fall to rage, but she’s still ridiculously overpowered. So she’s not completely idealistic…doesn’t really change the fact that no one can top her. Also, it makes me worry about what comes next. Medaka was easily outclassing Unzen before, but her supposedly powered-up form has arrived. If so, then how one-sided is the next episode gonna be? If Unzen just gets face-smashed the whole time, it can’t possibly be that interesting. So I’m hoping there’s a twist in there somewhere. If we assume that my theory of Unzen joining the student council is right, then it does sorta open up a possibly theory for next week. We’ve seen that Medaka loses her ideals in her new War God Mode, so she would theoretically refuse to save Unzen in any way. So if we assume that she has to save Unzen to recruit him, then something shuts off her transformation despite Zenkichi saying he has no control over it. Shot in the dark theory, but I guess it’s plausible. This week’s episode features Medaka facing off against the chairman of the disciplinary committee, Unzen Myouri, who appears to be the big enemy for the rest of the series. An interesting opponent because he is theoretically at her level (in the legendary class 13). As I said before, I was expecting one episode per disciplinary committee opponent, but it looks like all three were taken down at once. The enemy has appeared! In the form of Onigase Harigane, handcuff-wielding order maniac? Defeated today with the power of the love and peace!! (and two people kicking bats). Not completely sure where she stands now that she has “befriended” Medaka and Zenkichi…maybe she’ll stand up for them in next week’s episode or something. 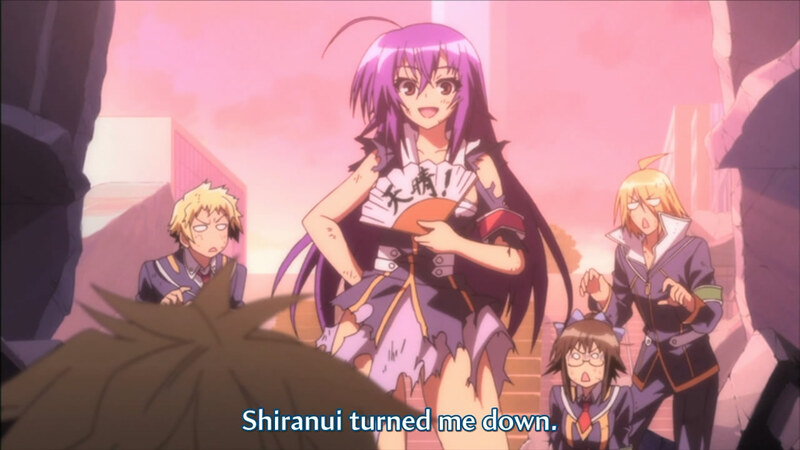 Side note: going after Medaka, then going after Shiranui…she’s not too bright, huh? Well, the star logo for the disciplinary committee suggests five members, which suggests that there is one enemy per remaining episode, finishing up with the big boss at the end…but the preview shows the chairman a lot, so maybe it’s something different? Beats me. Back to the half episode arcs, I guess. Well, I liked the first half…it was pretty funny to watch Zenkichi and Kikaijima awkwardly together in the student council room…each misreading the other. The second half…not so much. I didn’t really get what the point of it was. Just felt like space filling. At least with the other episodes, the second parts felt like they were helping to introduce a new character more. Maybe it was just an attempt to troll the female members of the show…. Either way, with the student council together, it looks like next week will introduce the big antagonist for the rest of the show, the school police. I’m curious about their motives…why they see the student council as a threat. 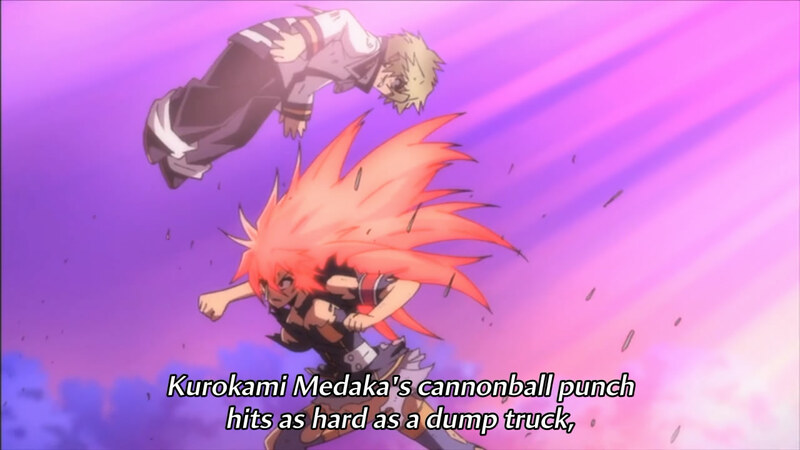 Do they think that Medaka is too much of a loose cannon? They’re probably right. Well, we’ll just have to wait and see. I think everyone’s assembled by now? 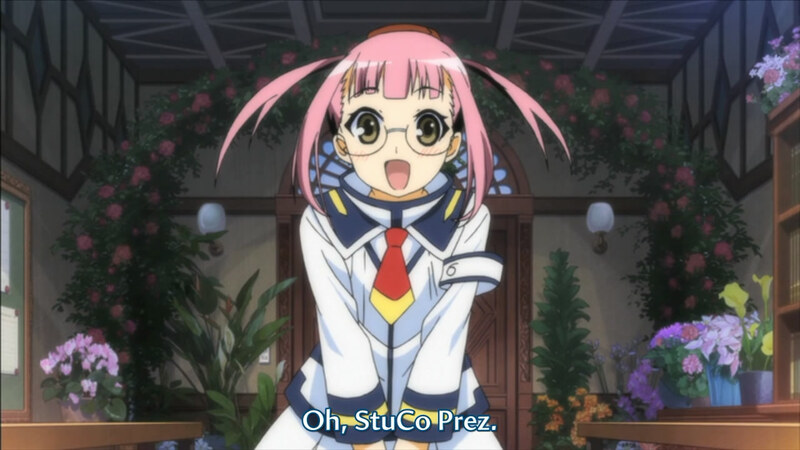 I’m pretty sure the treasurer Kikaijima Mogana was the last of the student council. 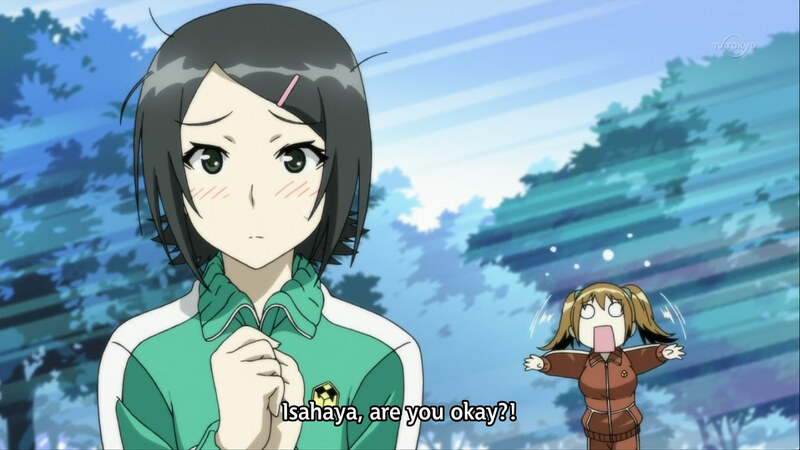 I’m stumped as to why I didn’t notice that she was the same person as the swim team girl. All of the signs were there…they needed a treasurer and she was in love with money. I guess my brain wasn’t all there last week when I watched this. As for the swim event itself, they made a big deal about the swim team being incredibly reckless with their tactics…but did those things they were doing seem all that dire? I guess I didn’t get the sense that they were excessively risking their lives like the show tried to emphasize. 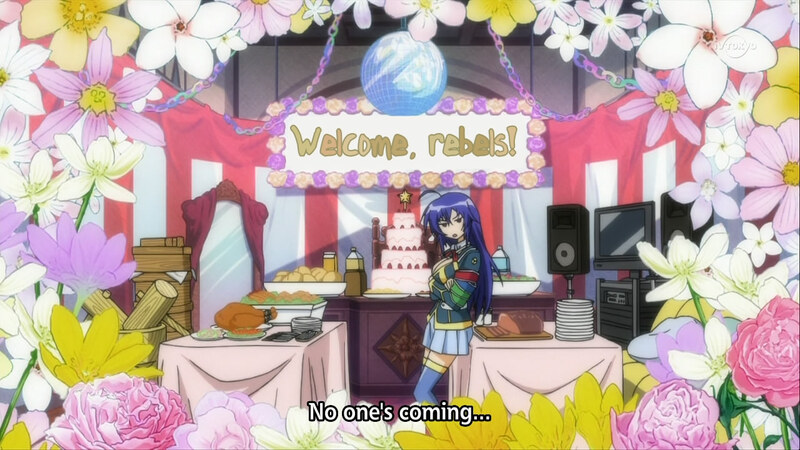 With the last event, was what Medaka did really legal? Technically those inflatable things were supposed to be worn by the guys…did that not count as enough for a disqualification when they took them off? Oh well…probably best not to question it. Although, it just seems to be pushing it a bit. Random side note: holy crap that swimming pool is excessively hi-tech O.o No wonder there was a request to have it used more often…Although, all of that tech has some serious safety implications. I guess next week is an episode for our new character? That’s all I can really see based on the preview. Half the series is left…is there going to be an overarching story? Would there even be enough time? This week’s episode looks like the start of a mini-arc. Glad it wasn’t a half-episode, I guess. 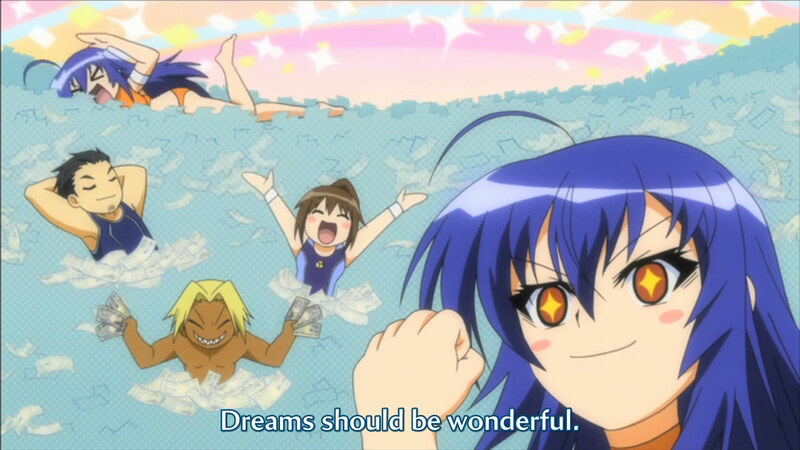 An interesting idea to place Medaka against a team of money-grubbers. 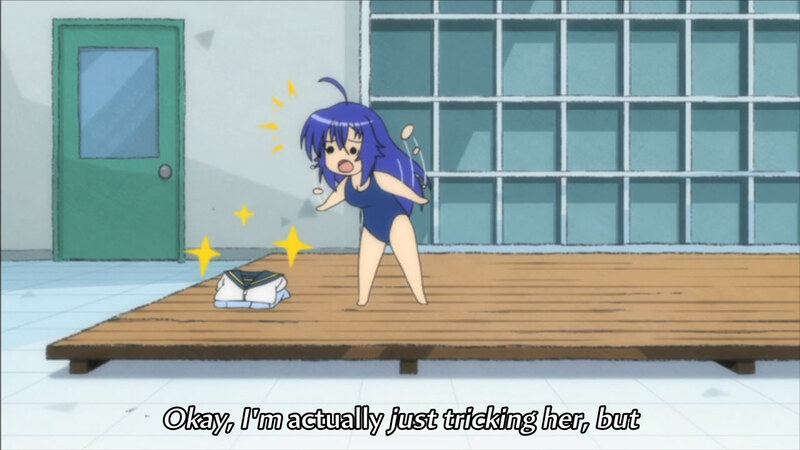 Although I question the idea of putting a swim team in a swimming event, I guess it was to create a scenario where someone could actually challenge Medaka. Also…swimsuits, I guess >.> I thought the flotation handicap on the males in the competition was pretty funny, but the gag didn’t go where I thought it was going. Just think about it for a second…forcing guys to have a source of buoyancy…what could that mean? Oh Shiranui…you’re so evil…Not in a “I’m gonna defeat the protagonist” way, but more of a “I know what you’ve been doing” way (*shivers*). Next week, the second event starts. Looks like Zenkichi and Akune won’t be able to just sit out again. And based on the preview…more eels >.> Come on…really? So I had a bit of a hard time watching this week’s episode. 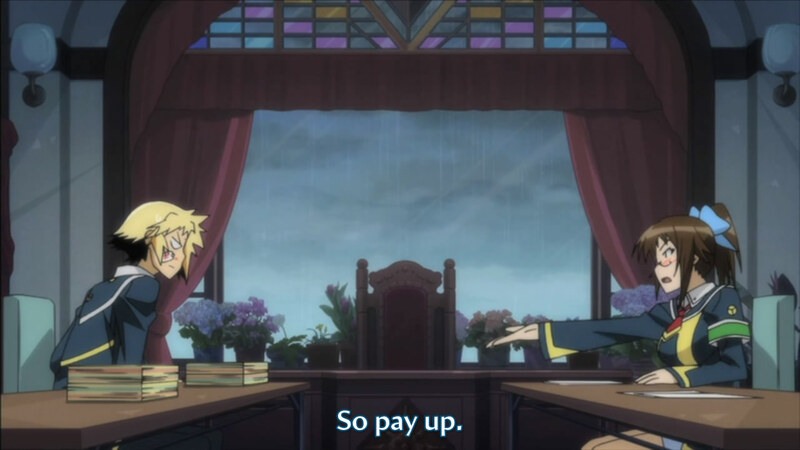 First off, it finishes off the bit with Akune and he joins up, then it sorta introduces him with a mini-request. I still don’t get the half episode thing…don’t see why Akune’s judo bit couldn’t be one episode itself. 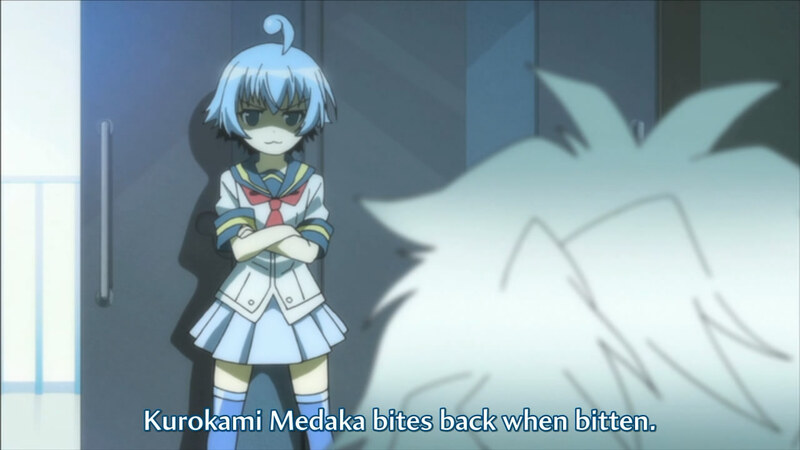 Anyway, was this episode more about Medaka trying to help out or was it just to showcase how well she can manipulate Akune and Zenkichi? With her outburst in the fight and the way she lectured Akune, it all looked like manipulation to me. Also, a handicapped fight? I guess it was to show just how hard Nekomi was trying to get Akune to quit or something. I really don’t have much to say about the second half…it didn’t really feel like anything happened. The preview doesn’t tell me too much about next week either…is it a Shiranui episode? Hard to call since she’s basically everywhere. I would think the last Student Council member should be introduced soon, but I didn’t see her. It could just be another random episode with the characters that we already have. I’m still searching for an overarching story…oh well. We’ll see. This week’s episode focuses a tad bit more on Zenkichi, who has been checking up on the various clubs at the school. The show seems to be taking a half-episode approach…with each episode having two stories. But they’re not happening simultaneously…one just happens, then the next one starts. Are the arcs really that short? I guess it lets them fit more stuff into each episode, but it just seems like everything happens quickly. 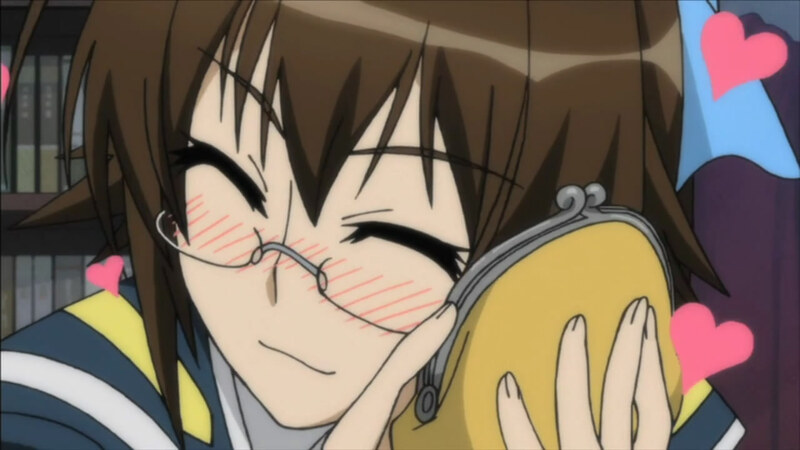 Anyway, we’re introduced to the next member of the student council, Akune Kouki, a member of the Judo Club that has actually know Medaka and Zenkichi for quite some time. 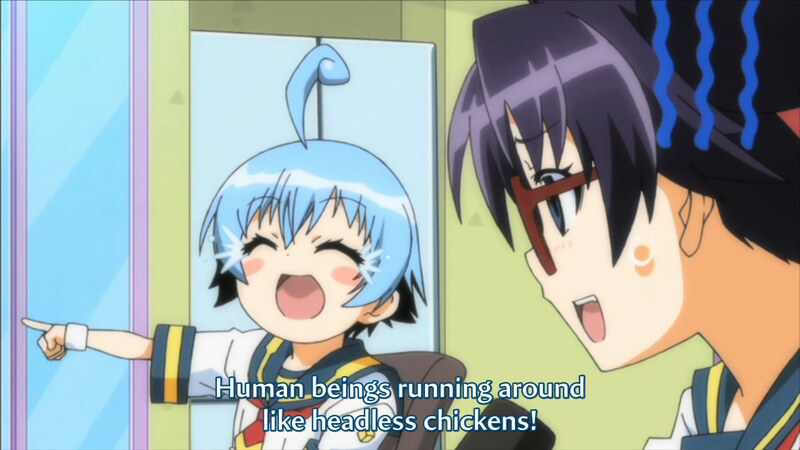 Unlike Zenkichi, Akune is obsessed with Medaka, hating Zenkichi because he’s always the one following her around. Yeah yeah…he’s not a member of the student council quite yet, but the preview and the opening show him sporting that student council uniform, so it’s gonna happen next week. Speaking of next week, logic would suggest that Zenkichi wins the judo challenge that was issued at the end of this week’s episode…still, there’s always that possibility that Akune is able to best him (it would seem pretty uncharacteristic of the genre, though). 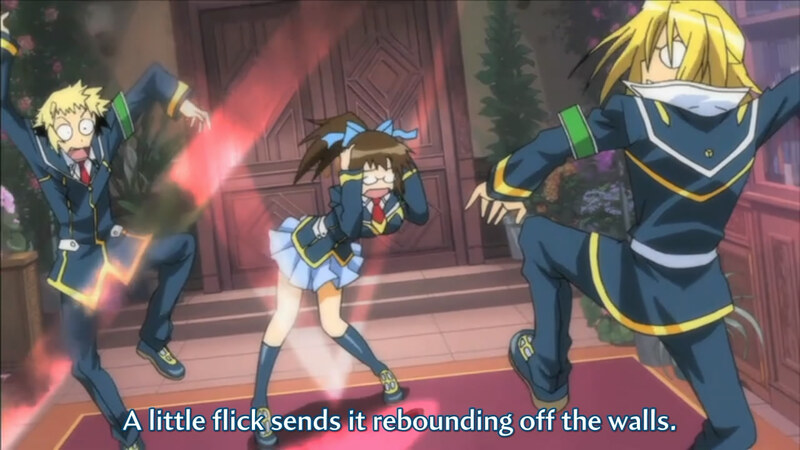 I’m still loving Medaka’s ability to just randomly show up in a situation…and the show is still entertaining me. I’m curious about this genre shift, though >.> I don’t even know what this first part counts as…assembling the team, maybe? Going back to the mini arcs that the show has adopted. I wonder if it is intentional, but the first part with Kanoya felt like it was swallowed up by Akune’s part. When they introduced Akune, my mind thought “he’s a main character” and just disregarded the first half of the episode. I feel like that might be a problem. Well…maybe they’ll change things up now that they’re actually adding on new members. Look forward to watching.